One of my favorite questions to ask the newly engaged that I sit down with is, "Are you guys planning to do a First Look!?" - I can't help but get excited over the answer, every single time. Every so often I run across a couple who isn't sure what that phrase means, and hey that's okay! It isn't a phrase you hear every day, unless say...you're a wedding photographer! ;) So for any of you who aren't sure - A first look is when the bride and groom choose to see one another before their ceremony in a staged, private area (minus their photographer that is) - and it's pure magic! I can completely understand those who choose to NOT do a first look, after all, if you want to be traditional, seeing one another prior to the ceremony would be gasp-worthy unthinkable! There's absolutely nothing wrong with sticking to the traditional route for your wedding day, heck I did it. The point of today's post though, is to show you what happens when you DO choose to do a first look, and share my opinions on this big decision! Personally - My husband Wes and I chose to be traditional, and while he still feels mostly solid on that decision, I on the other hand, would choose to see each other prior if we were to do it all over again - hands down. There's no question!! To this day folks, and we've been married now for almost 4 years - I can't for the life of me remember what his face or reaction looked like when I walked down that aisle on the arm of my Dad. I was entirely too busy being overwhelmed with EVERYONE ELSE staring at me. It was intense. I WISH I would've had that moment now, just us, to soak it in and feel all the feels - and had our photographer quietly document it all! First Looks offer soooo much genuine emotion, it's hard not to love the images that result! Like when your hubby-to-be is just overcome with emotion! And needs a few minutes to take it all in! Aren't those moments simply magical you guys!?? There are also a few practical reasons to do a first look, so let's cover those! 1. You have limited time or want less time in between ceremony & reception. >> If you don't want to keep your guests waiting too terribly long, or you yourself can't wait to go celebrate with everyone - Doing a first look means you can knock out the majority of your photos before you even say I DO! That means all your family formal portraits, all your wedding party group shots, and even most of your bride and groom romantic portraits! I always suggest, if time permits, that we do a few more of you and your new husband after you've said I Do - for various reasons, but by then, that doesn't take long at all! 2. You're super nervous, and/or worried you might cry...or cry a lot. >> Do I even need to explain?? Haha - Get those waterworks out when it's an intimate moment with your best friend, not when you're standing in front of a huge crowd! >> When you guys choose to do a first look, you're banking on receiving even MORE photos from your photographer because there's this whole new part of your day we get to document! More moments, more photos! 4. Private Moment for you and your Groom. >> Truly, a wedding day is chaotic, and for the most part, there won't be a time in which you're alone to talk to one another, to hug, to kiss, to not be swarmed with family, guests, etc. Yes your photographer will be there, but photographers know that the meaning of this moment is huge and we stay out of the way to allow you that privacy. You guys just get to be you, together, and take a little breather! 5. 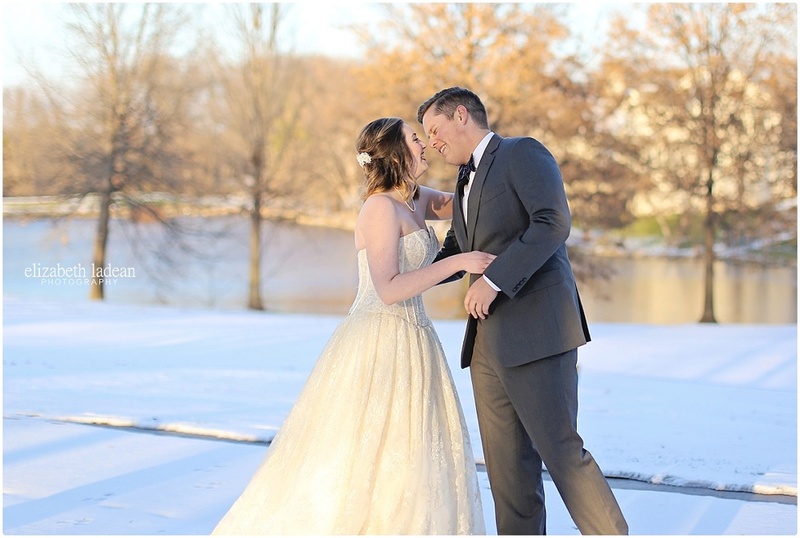 You're having a winter wedding, or a late-starting ceremony. >> Winter weddings can be gorgeous, but let's face it - daylight is quite limited. Same bodes true for wedding ceremonies that begin late in the evening, or even at night. Us photographers LOVE natural light. Natural light is like crack to us, kay? Kay. You won't ever, ever regret allowing for time during natural light for your photography coverage. Trust me, I'm a pro. Ha! If we're going to run out of daylight, you're going to want to have the majority of your photos done beforehand when the lighting is ideal! Lastly, let me just say that choosing to do a first look doesn't take anything away from the moment you walk down the aisle - That moment is still special in its own right! One more lastly-comment! :) It's YOUR wedding day, so make it your own and do it however you've always dreamed of doing it!! Happy Wedding Anniversary, Jaclyn + Trevor!